This photo is a good example of what we have been doing during the last days. After two weeks harvesting, we decided to take a brake so the grapes on the vines can finish the phenolic maturation. All our vineyards located in the bottom of the valley were already harvested. During the next week, should the weather help, we will start harvesting Quinta da Trovisca, located 550 meters above the sea level. After finishing the harvest in Trovisca, we shall move to Senhora do Rosário, located around our winery. So, the question now is, what is on the photo? This is the moment of the fortification. We are adding a 77% alcohol by volume “brandy” to inhibit yeasts of transforming more sugar into alcohol. 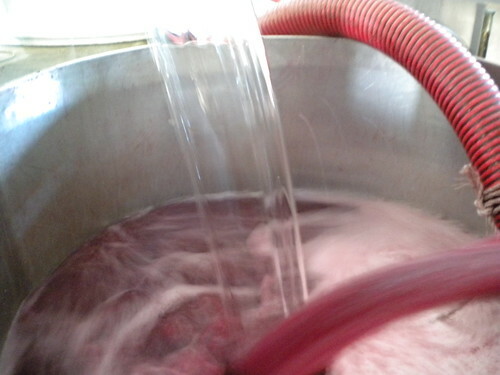 This way fermentation stops and we get a sightly sweet wine, Port Wine, also known in the Douro as Vinho Generoso.